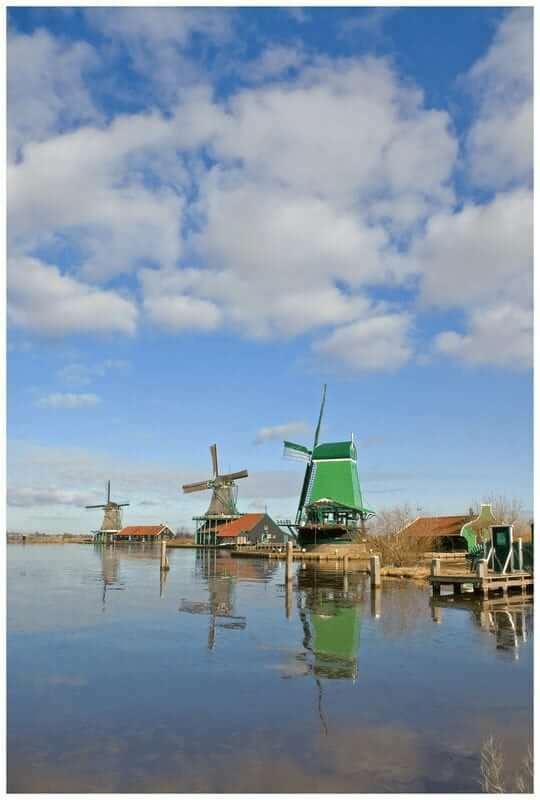 This tour with the premium ships Magnifique, Magnifique II and Magnifique III combines many highlights and gives you a fantastic impression of characteristic Holland. 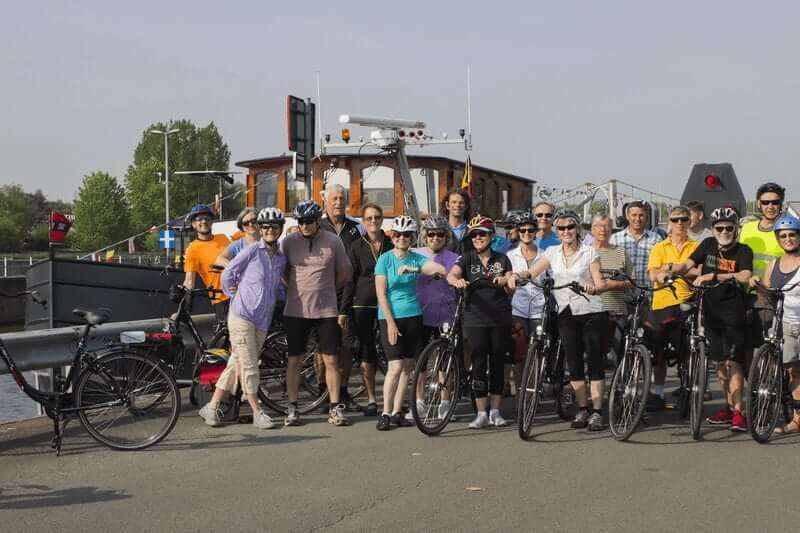 The cycling cruise starts in Amsterdam, with an enjoyable dinner cruise to Zaandam. 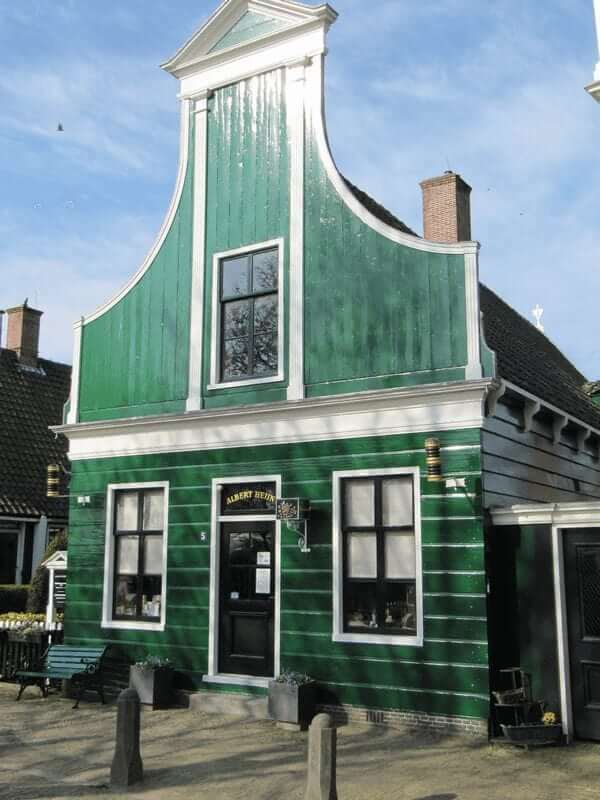 Followed by the Zaanse Schans open air museum as a must see highlight the day after. 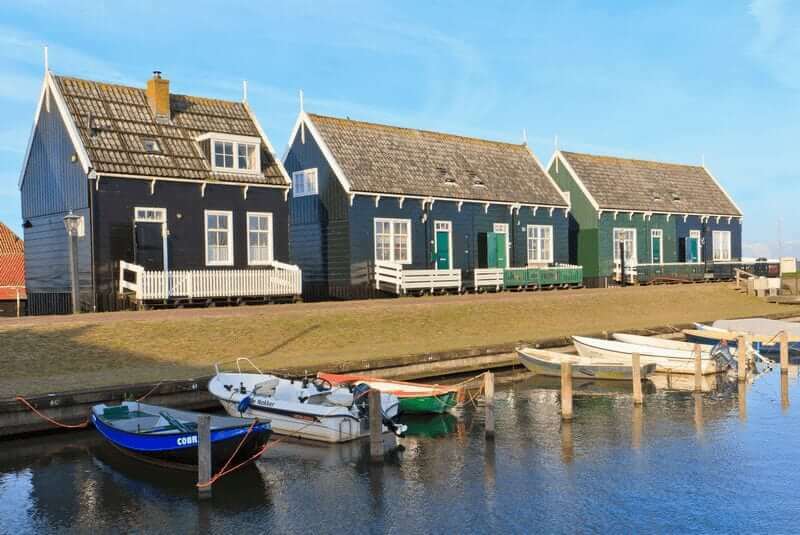 Enjoy a cycling tour to Volendam through the unique wetlands of Waterland, a large open area with tiny lakes and canals. 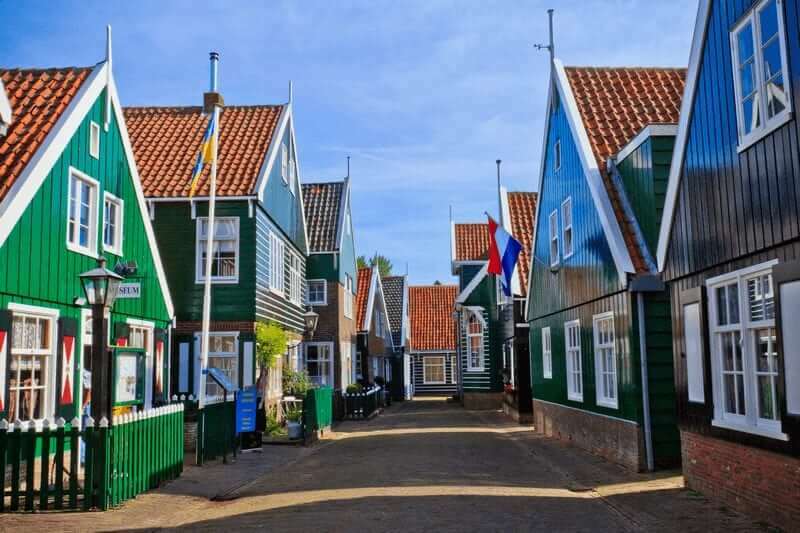 This town is famous for its harbor, fresh fish – like eel and herring – pictures in typical Dutch costumes and the ‘Palingsound’; a kind of Dutch folk or country music. 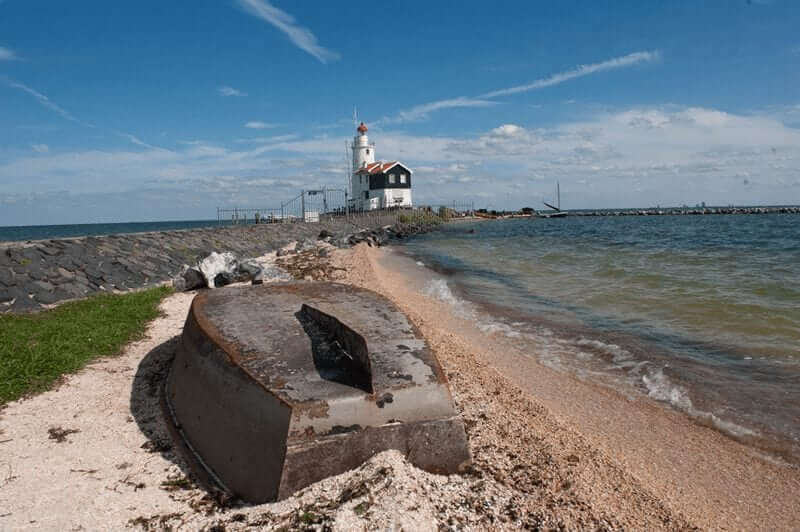 You will also visit the picturesque former island of Marken. 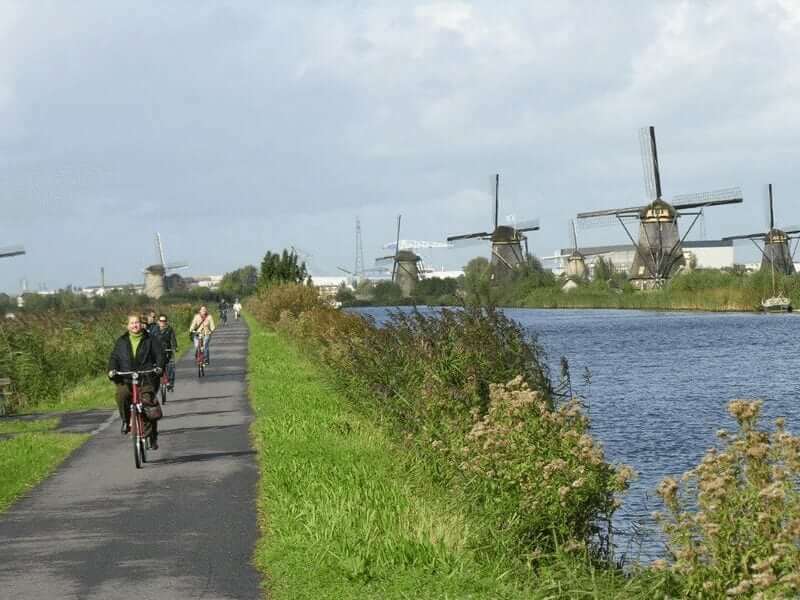 From there you will cycle to IJburg, the newest part of Amsterdam. This part of the city was built in the late nineteen nineties on reclaimed land, that was the bottom of the sea just a few years before. 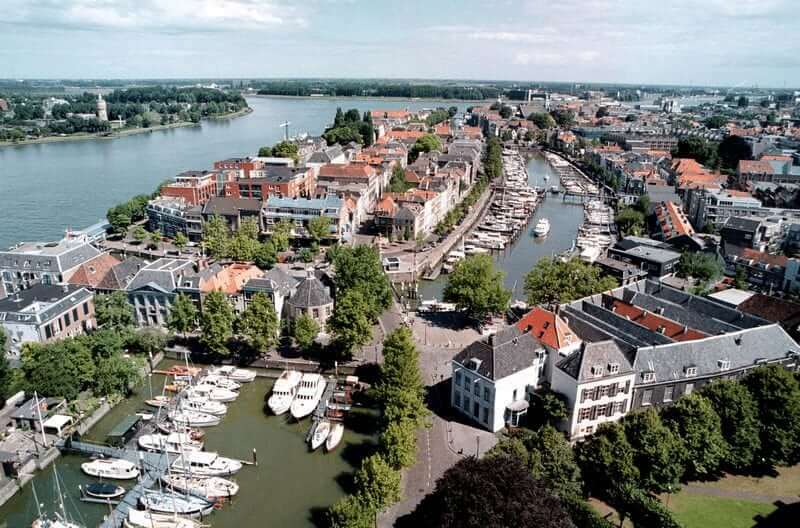 Continue by barge to the small town of Vianen on the Lower Rhine River. 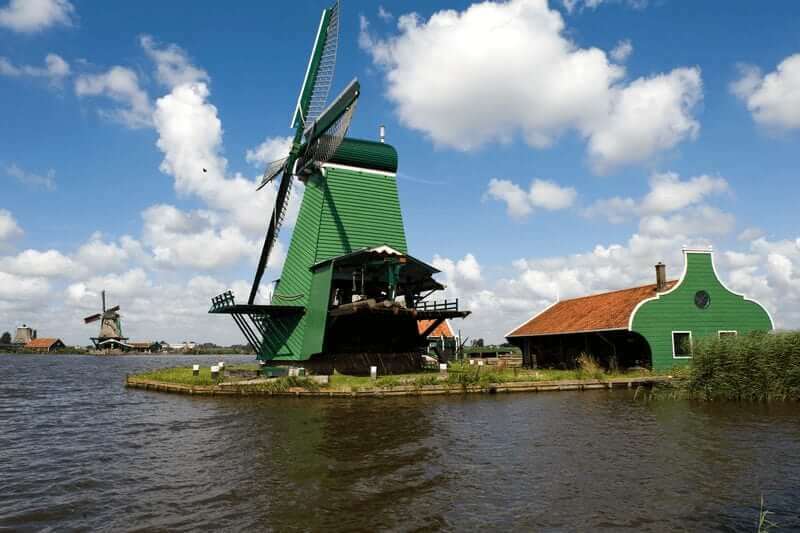 Visit Schoonhoven, well known for its silver, and the UNESCO site at Kinderdijk, with its 19 windmills. Lovely views and beautiful pictures guaranteed! 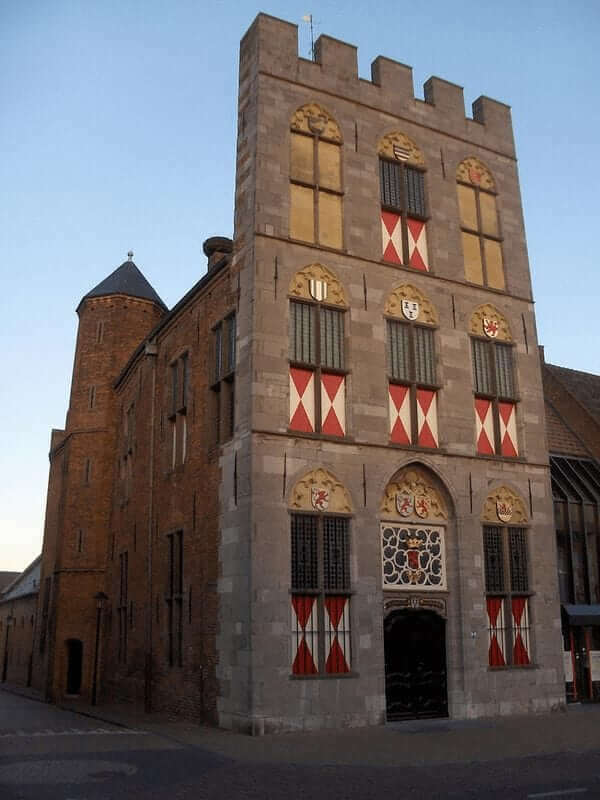 Enjoy the old city of Dordrecht that already obtained city rights in 1220 ad. From here the tour continues north to Gouda, world famous for its cheese and candles. 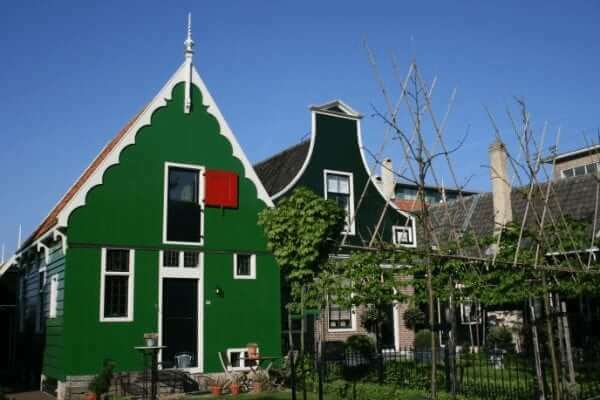 Explore the Green Heart of Holland, a large rural and green area amidst the horseshoe-shaped ring of cities in the western part of the country. You’ll spend the night in a small village in the Green Heart. 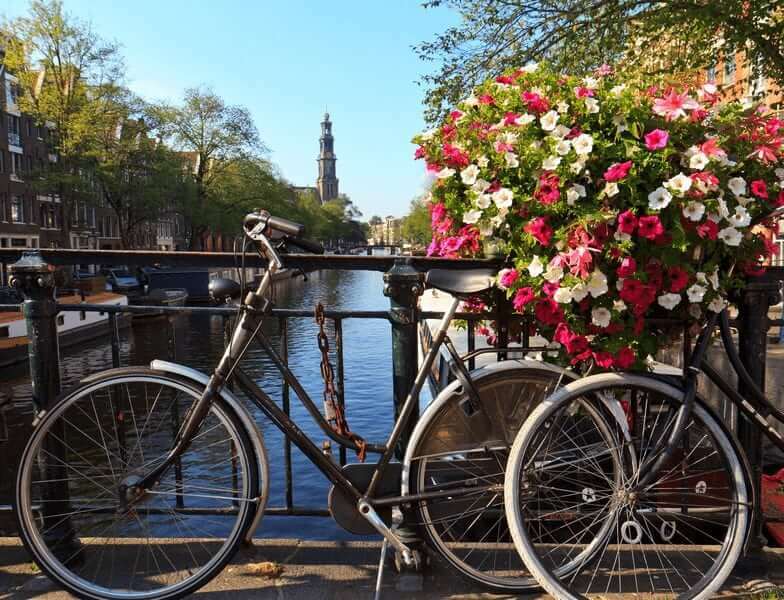 Cycle or sail into Amsterdam, where your journey ends. The Magnifique II tours start and end on WEDNESDAY and the tours with the Magnifique and Magnifique III start and end on SATURDAY. Embarkation and check-in. 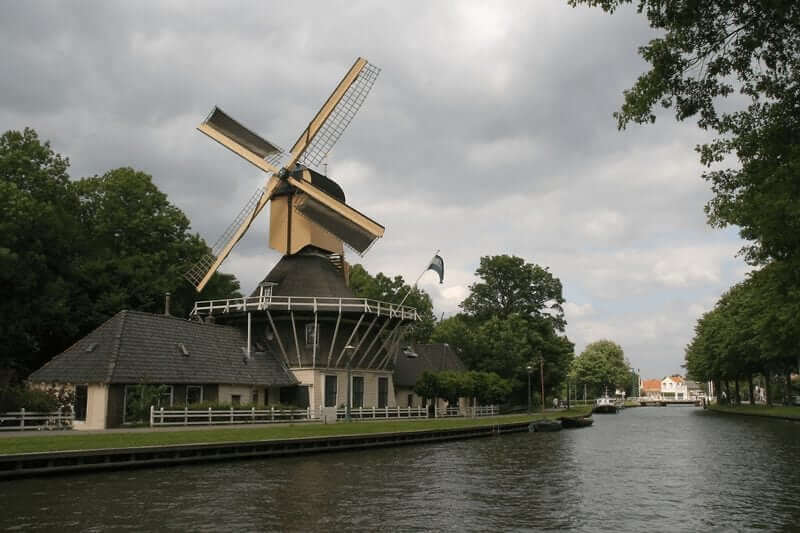 The crew will welcome you on board between 1 and 2 p.m. As soon as all guests have arrived a short cruise will bring you to Zaandam, a spot famous for its windmills. Here, your barge will berth in the center of the city for the night. Upon arrival you can enjoy taking your new bike for a brief test ride through the surrounding area. 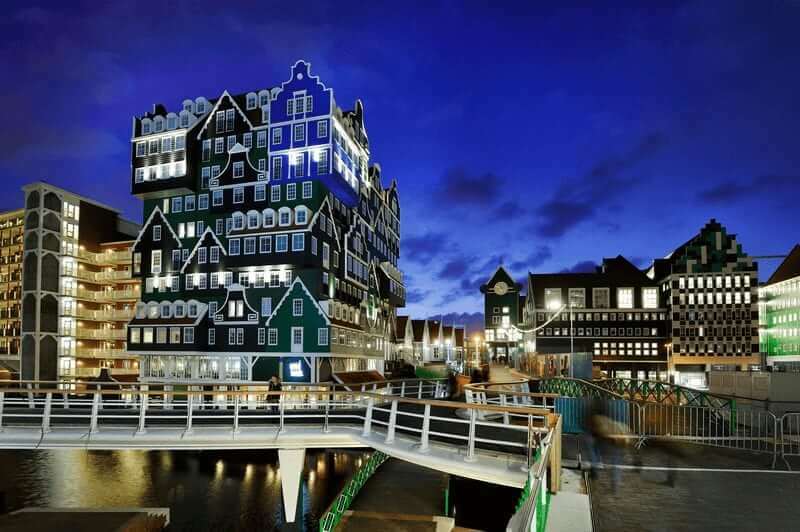 In the evening, enjoy a short walk through the picturesque center of Zaandam. After breakfast: start of the first cycling tour to the open-air museum Zaanse Schans for a short visit. 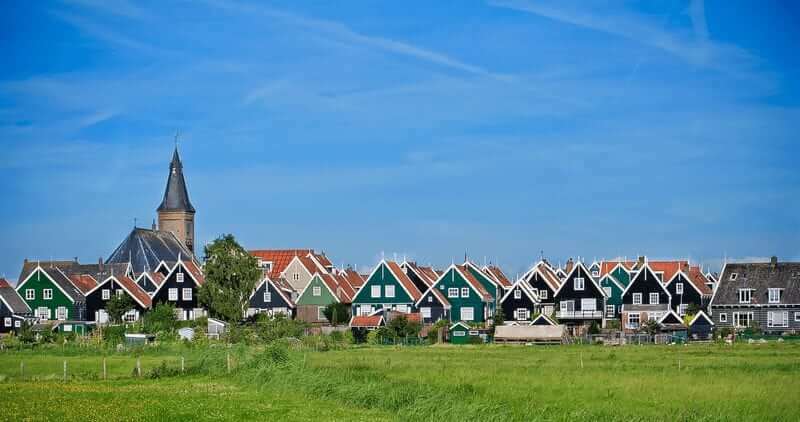 Continue cycling through small villages in the beautiful wetlands of Waterland to Volendam. The ship sails via Amsterdam to Volendam. 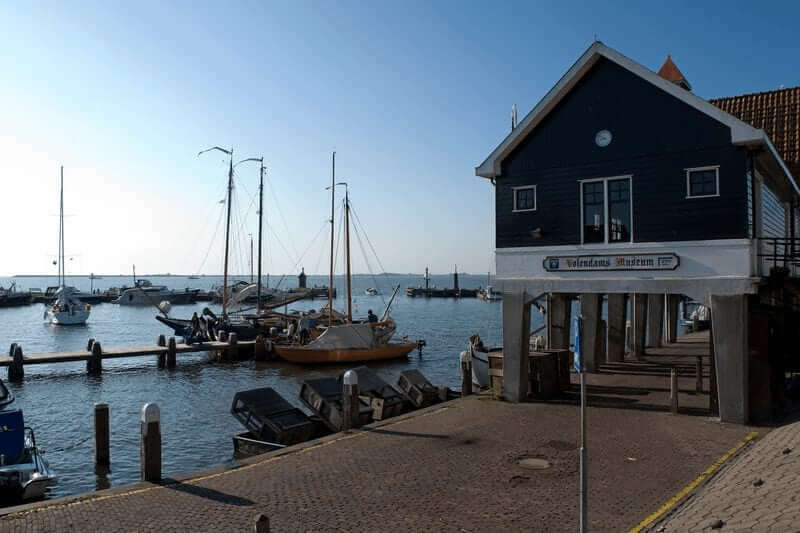 Late afternoon, dinner, evening and night on board in Volendam, the small and picturesque fishing harbor on the shores of the Lake IJsselmeer. After breakfast, you will take the ferry for a 30 min. 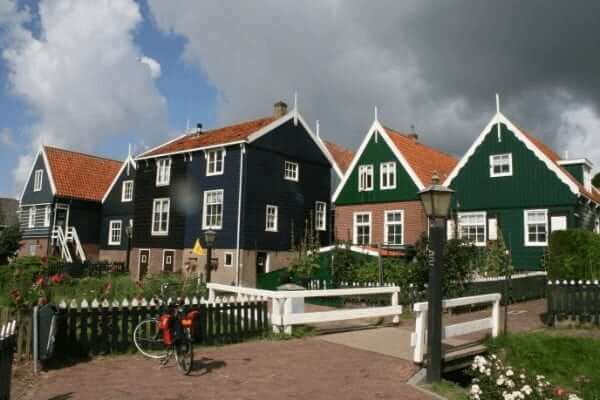 crossing from Volendam to the former island of Marken. 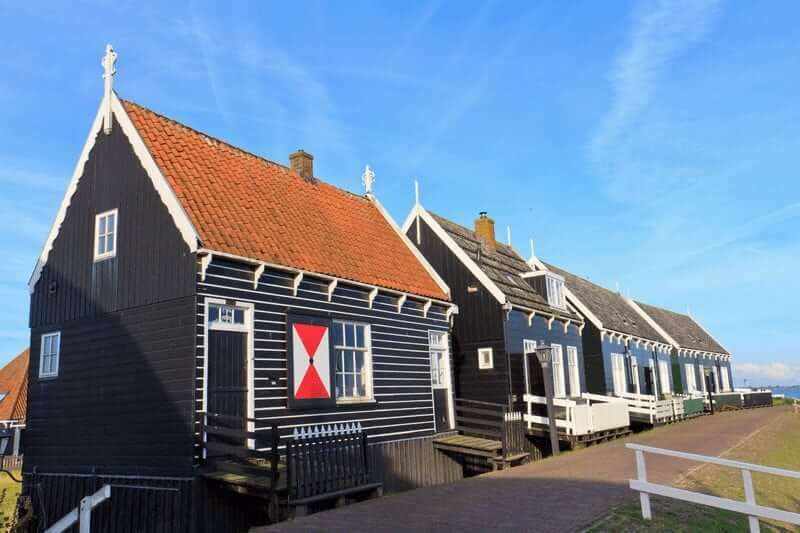 Visit this nice, authentic village and continue cycling along the coastline towards IJburg, a new and modern part of Amsterdam that was recently built on reclaimed land from the sea. 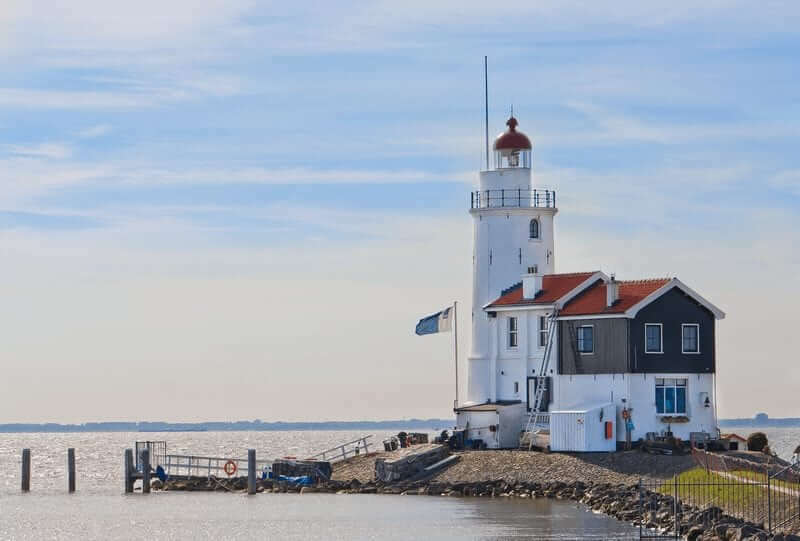 From here you’ll cycle to the historical town of Muiden with its 14th Century castle on the waterfront. 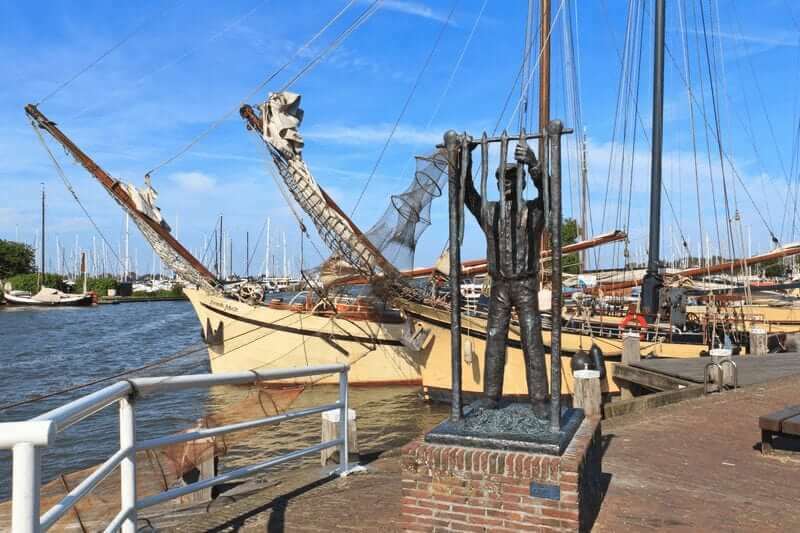 Your cycling tour ends close to the village of Weesp, where the ship is moored. 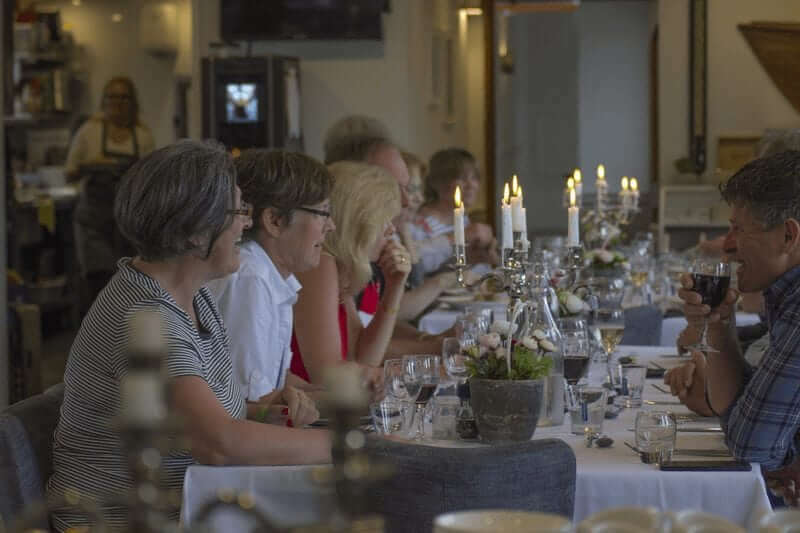 Around 5 p.m. the ship departs for Vianen and you can enjoy dinner while cruising. Evening and night on board in Vianen, a small fortified town on the lower Rhine River. Today you have 2 cycle options, both starting in Schoonhoven. The ship will sail during breakfast to the ‘Silver City’. 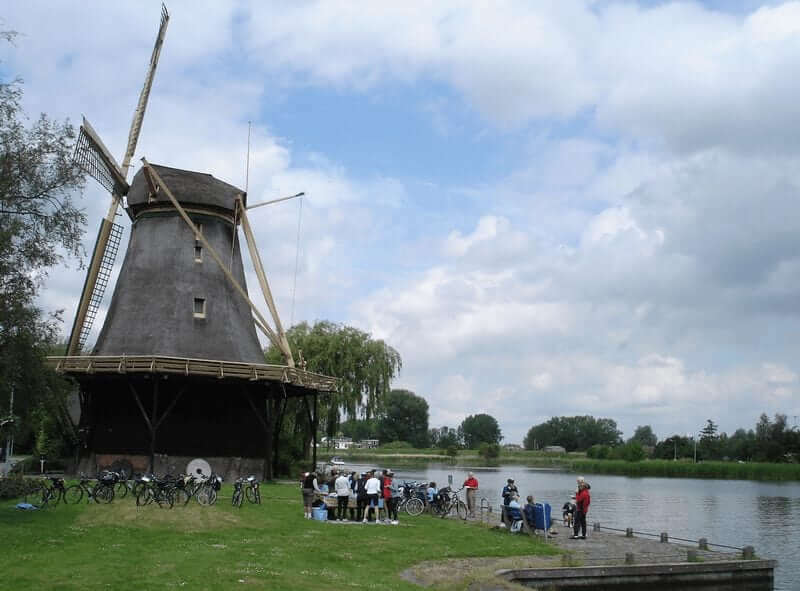 The cycling tour takes you from Schoonhoven through the Alblasserwaard polder to Dordrecht. In the morning you will visit a cheese farm where you will learn about the traditional cheese-making process and you will have the opportunity to taste the results. 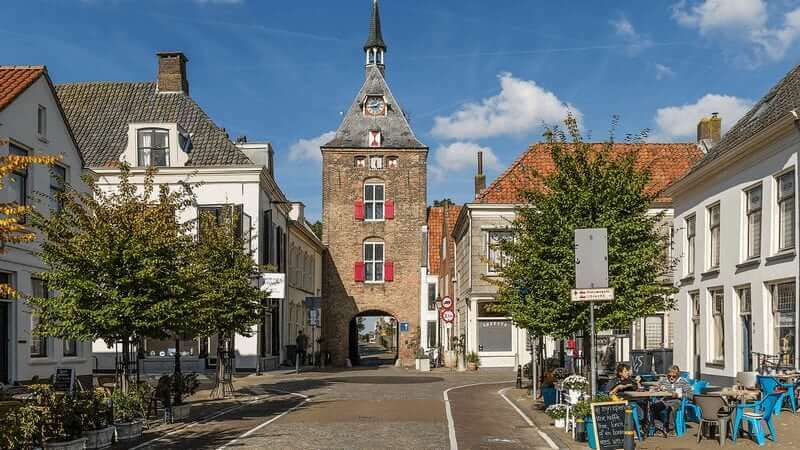 Dordrecht, or Dordt as it is called by insiders, is one of the oldest Dutch cities, on the conjunction of 3 major rivers. In the evening, after dinner, you can join for a short city walk. You will spend the night in Dordrecht on board of the ship. 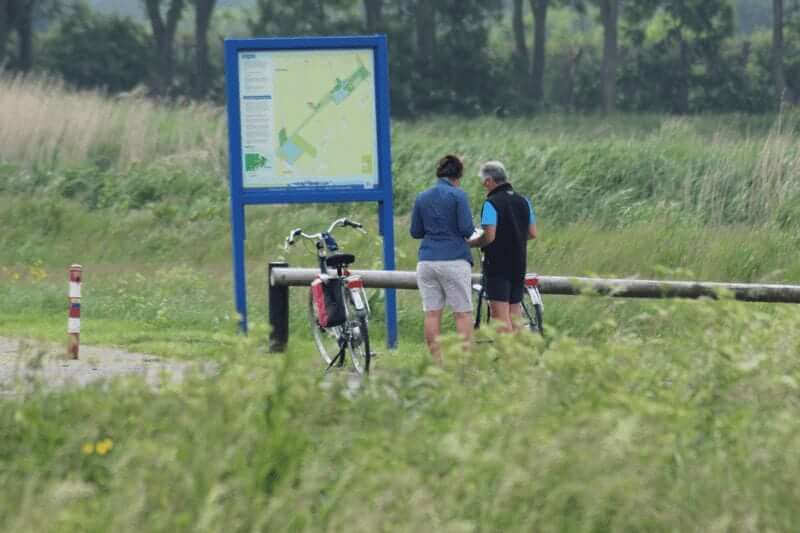 When you’ve finished breakfast you will return by Waterbus to Alblasserdam to start your cycling tour. 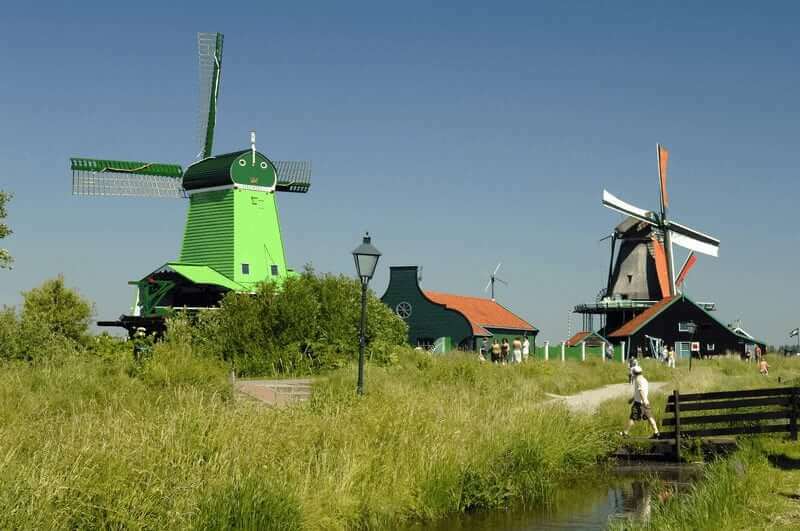 You cycle through the Alblasserwaard region to Kinderdijk, a village famous for its impressive row of 19 large windmills. 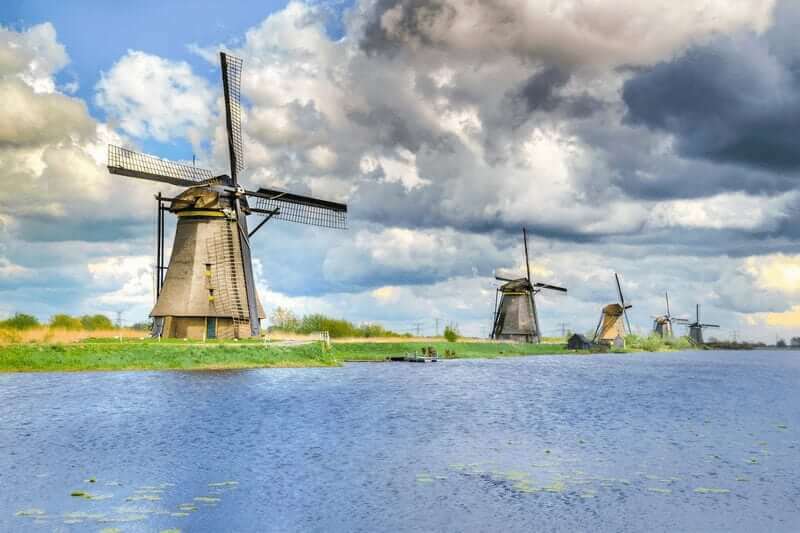 All 19 windmills have a UNESCO cultural heritage listing and are a definite highlight – so don’t forget to bring your camera! 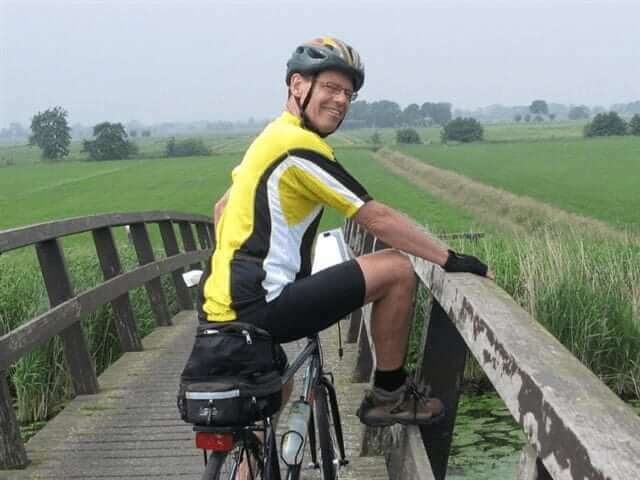 Continue cycling to Gouda, the cheese and candle capital of Holland. 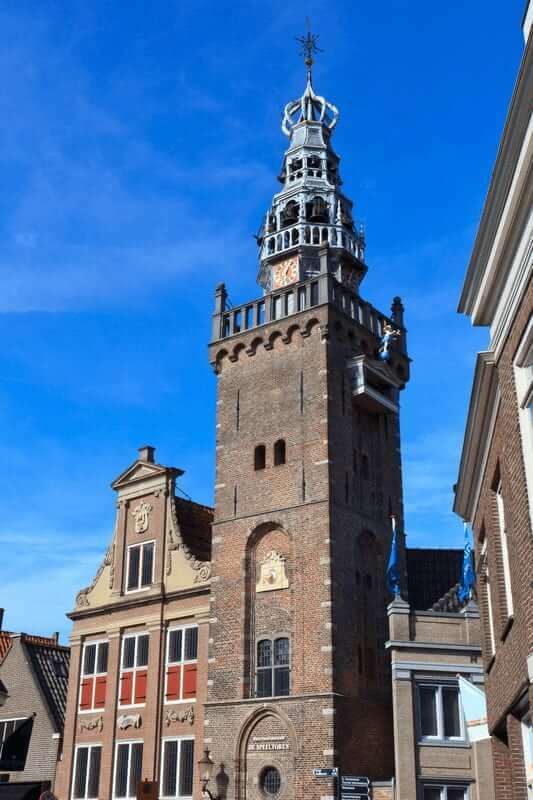 Enjoy this beautiful historical city, the old market square and the Cheese Weighing House during the afternoon and evening. 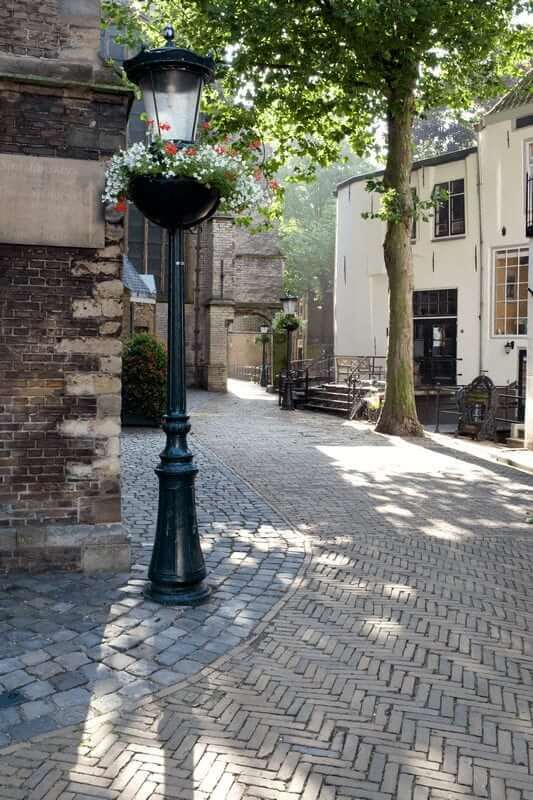 This evening dinner is not included, so you will enjoy a wonderful meal in one of many restaurants in Gouda. We have various restaurant recommendations available on board. 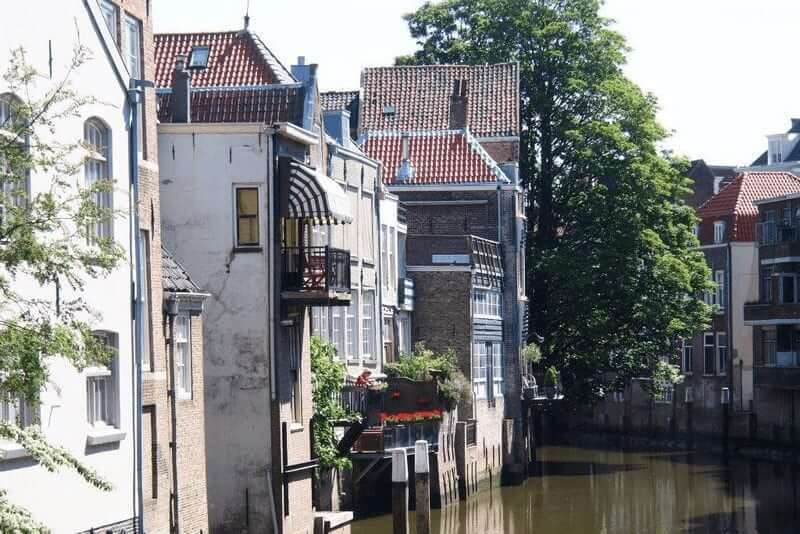 In the morning you will spend some time in Gouda. 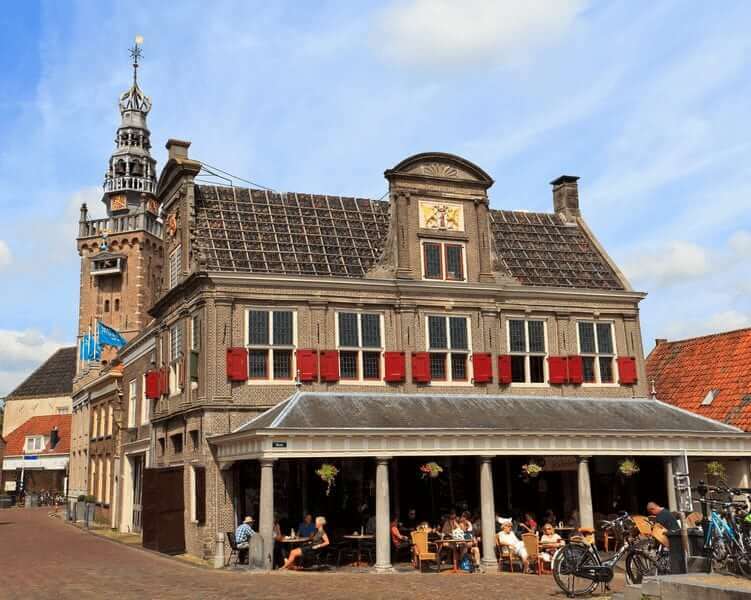 Enjoy this beautiful historical city, the old market square and the Cheese Weighing House. A visit to the St. Johns church with it’s world-famous stained glass windows in on the program. 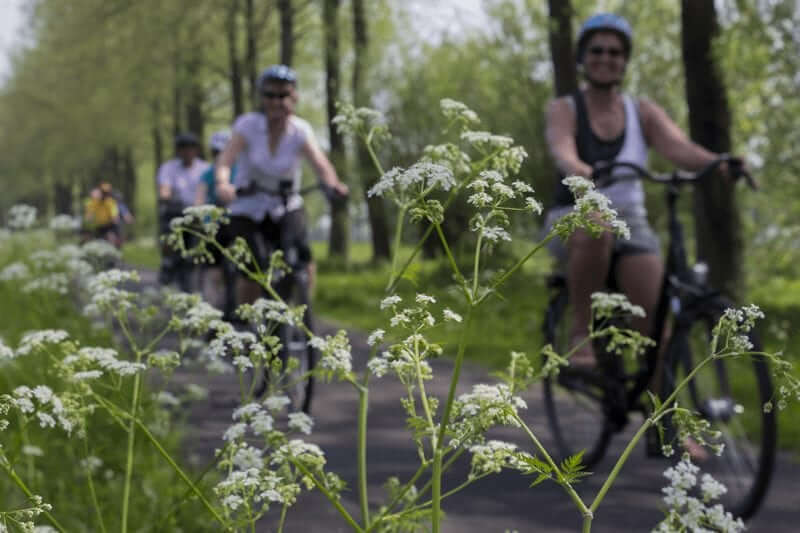 Today’s cycling tour starts in Gouda and shows you the typical scenery of the so-called Green Heart of Holland with green landscapes, wide views, small canals and tiny lakes – all below sea level! The cycling tour leads via Leiden, the birthplace of famous painter Rembrandt and residence of the oldest university of the Netherlands. 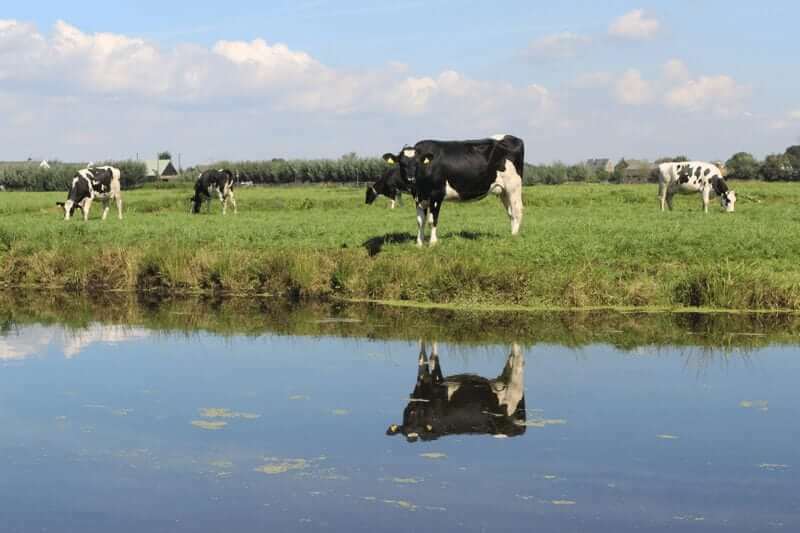 The short option ends in Alphen, the long option in Oude Wetering. Dinner, evening and night on board the ship in this small village. This morning the ships starts sailing early to take you through Amsterdam. 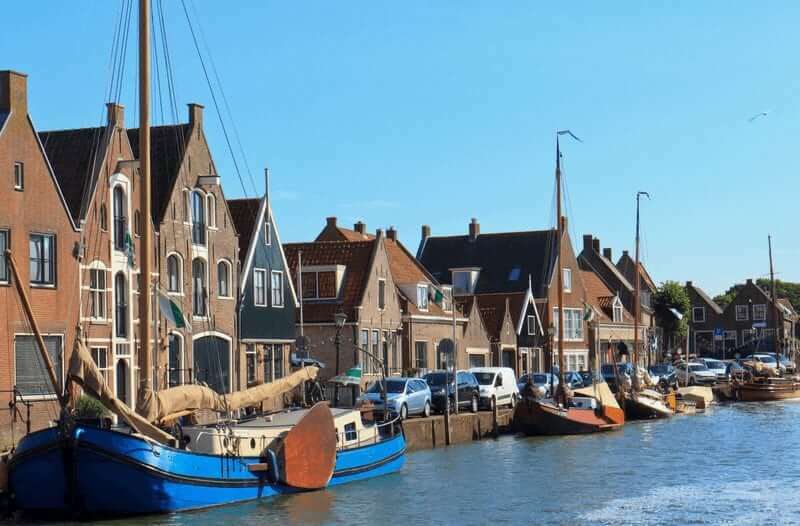 During the afternoon you either have the opportunity to make a last beautiful cycling tour through the wetlands of Waterland or to discover this amazing city. Visit the inner city flower market, a museum, do some shopping… there is just so much to do! 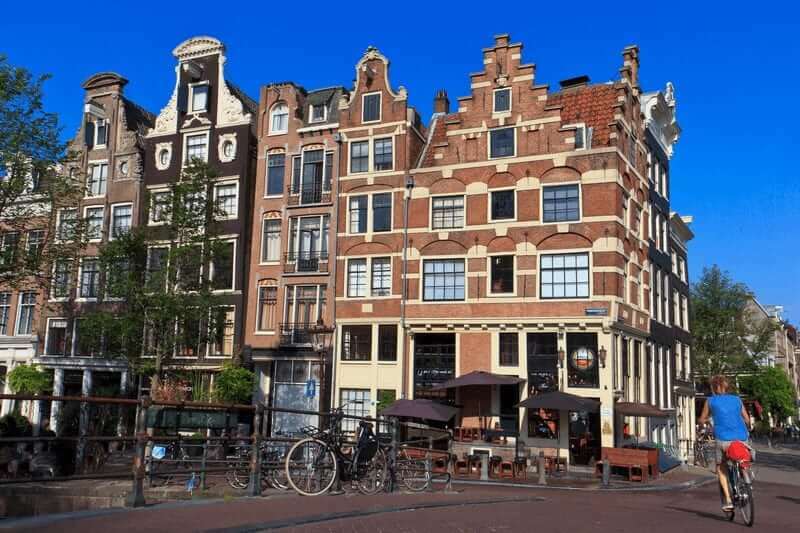 In the evening you can join a boat tour through the beautiful canals of old Amsterdam (UNESCO cultural heritage). A wonderful way to conclude of your trip! Check-out and disembarkation right after breakfast, before 9.30 a.m. 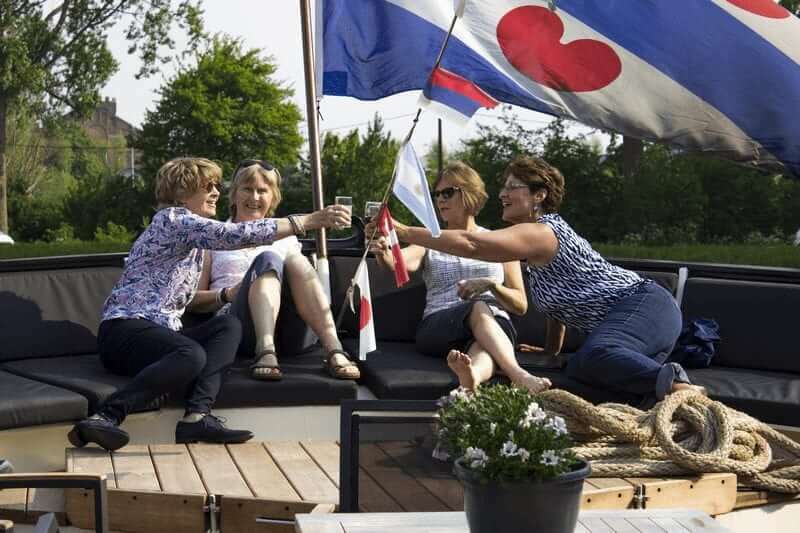 Wonderful week on the Manifique 3 – Best of Holland tour. Lots of fun and easy cycling. This younger sister of the Magnifique, the Magnifique II, was built in 2015-2016 and offers a wonderful stay to a maximum of 34 guests. All of the 13 cabins on the lower deck and 4 suites on the upper deck are very comfortable: excellent beds and a private bathroom, as well as air conditioning, satellite TV, and a wardrobe with a mini-safe. In the tastefully furnished salon on the upper deck, the bar is a real eye catcher. On one side you’ll find the restaurant area and on the other there is the lounge. The captain and his crew will take good care of you! The bicycles on board are mostly unisex hybrid bicycles of the brand Velo de Ville with normal mount (ladies model), easy-to-handle Shimano 7 gears, handbrakes, gel-saddle (height adjustable), a lock on the frame and a pannier bag. There are five bicycles on board with hand- and back pedal brakes. All bikes have 28 inch wheels. Some smaller frames are available on board for smaller persons. The e-bike is Velo de Ville with Nexus 7 gears, 5 support levels and handbrakes only, gel-saddle (height adjustable), a lock on the frame and a pannier bag (or a comparable brand/model). E-Bikes limited available, on request and at an additional charge. Bike rent is optional. Guests are also allowed to bring their own bicycles or E-bikes (at no extra cost). However, the crew or tour operator is in no way responsible for any damage, loss or theft of such bicycles. Other bikes (e.g. children’s bikes, “slip streamers”, tandems, etc.) and child saddles (rear) on these tours are only available after prior request (by booking) and confirmation and in very limited numbers. After the overwhelming success of the premium ships Magnifique and Magnifique II there is yet another sister: the Magnifique III. She was introduced into our fleet in April 2018. This beautiful ship has 16 lovely cabins on the lower deck, all with two very comfortable beds, an en-suite bathroom, satellite TV, mini-safe and hairdryer. The 5 suites on the mail deck also have a small sitting area and large windows. The restaurant and lounge area are situated around the prominent bar; ideal spots to enjoy life aboard! Let’s not forget about the Jacuzzi and deckchairs on the top deck. The bicycles on board are mostly unisex hybrid bicycles of the brand Velo de Ville with normal mount (ladies model), easy-to-handle Shimano 7 gears, handbrakes, gel-saddle (height adjustable), a lock on the frame and a pannier bag. Five bicycles have hand- and back pedal brakes. All bikes have 28 inch wheels. Some smaller frames are available on board for smaller persons.